I was completely fascinated to find this page of notes about real life for the upper classes in the Middle Ages, and it addresses one of the things I've always wondered about. In fact, I came upon it while specifically searching for information about rushes as floor covering. In this piece, the author rejects the idea of loosely strewn straw-like rushes (in rich households), because of the impracticality of the ladies of the house, with their sweeping gowns, navigating such domestic terrain. She opines that what was actually used were woven mats made of rushes, which seems to make more sense, especially since woven/braided rush mats have been in existence since at least 4000 BC (scroll to the bottom) - and so why wouldn't these wealthy families have these instead of scattered rushes, at least in all the areas where the family members were likely to frequent? Could "rushes" just have been shorthand for "rush mats" in some cases where we have recorded references to this practice? (I'm assuming "doors" is just a typo here, and should have been "floors.") Was he speaking of more common dwellings, instead of rich families who had the manpower to have the rushes at least changed quite regularly, if not replaced by much more practical woven mats that could be removed, shaken out and/or washed, allowing for the floor beneath to be cleaned?... not to mention solving the problem of "strewn rushes" being plowed through by trailing gowns, capes and cloaks? But perhaps those lavish gowns and outer garments were rarely worn, for significant events and high social occasions only? Did even the most aristocratic ladies wear far more practical, floor-escaping dress in their day-to-day lives? I've also wondered about dried rushes as flooring in castles where candles and lamps were the nighttime light sources, in combination with tapestries hung over the walls, curtained beds, etc... the stone floors and walls wouldn't have burned, but it seems like the inhabitants of those rooms would certainly have been at great risk. And... of course, it doesn't take a modern mind to recognize that insects and vermin will quickly infest aging/moldy straw/rush debris. For poor people who spent every waking moment struggling to merely insure their basic survival, this is perhaps simply one of the many things that they didn't have the luxury to address, but what about the luckier few... what were their floors & rushes practices? Also, I do understand we are talking about a period that spans centuries, and significant geographical and cultural differences - in a time when few were literate, so precise Best Practices manuals addressing something so mundane cannot be expected, but if you have more info, well... I'm oddly curious, and welcome any insights and/or links. In reading novels set in 'medieval' times, I have often wondered the exact same thing re rushes on the floor. I don't see how in any way rushes strewn all over the floor would be effective or practical in any sense, but the idea of rush mats makes perfect sense. I wait with bated breath for the inevitable genius from the MeFi hive mind. I presume Erasmus was talking about lower class dwellings. If you are talking about Erasmus' age, in Britain, rugs existed and I presume that's what rich people used. You forgot to mention a couple of other practicalities. The same Erasmus advised in his works on etiquette, that it was not so nice to spit on the table, while others were eating. It was better to spit on the floor. That same floor could be used as a toilet as well, judging by what Erasmus or Norbert Elias wrote about it, in his Civilizing Process. I am a historian, yet everything but a medievalist, but it wouldn't surprise me to learn that floors often would be covered in fine sand, that would be refreshed once in awhile. As we do with cat litter. But this is nothing more than an educated guess. "The core of Rush Matters' work is traditional rush floor matting, also known as medieval matting and apple matting. The rush is plaited by hand, using a 'nine end flat weave' into lengths three inches wide, and then hand sewn together with jute twine. " Can't help on the historical element to this but as a data point if you stepped into a stable that has been 'deep littered' (the solid matter picked out but the urine left to soak into the straw, a fresh layer of straw placed on top) you might be surprised at how solid a floor of strewn material can become. Pros - really warm (warmest place to stand on an English farm in the winter = the dung heap), less work than getting rid of everything each time. Cons - smelly and your stable floor gets gradually closer to the roof until you dig the whole thing out. It might be helpful to consider the different standards of cleanliness that people, even aristocrats, held during the middle ages. I'm not a medievalist, but I've never heard anybody refute the clichés about universal stinkiness (no offense to the knights and ladies out there). I doubt most people cared about their dresses getting a bit dirty or raggedy, and the richest, fanciest people could just have new dresses made whenever they wanted. Just one of the benefits of being near the top of the feudal system. I don't know anything about this, but: You seem to be assuming that the Erasmus passage definitely means loose rushes rather than mats. I don't see that at all. He doesn't specifically say either way. If anything, a reference to the "bottom layer" gives (very slight) indication that layers are discernable, i.e. they *are* mats. Can't they just be laying out a new layer of mats on top of the filthy old ones? Modern renovations often do this. Build a floor on top of the existing floor, put a drop ceiling right below the original ceiling, put new wallpaper/paint/paneling on top of the old, etc. Google Books to the rescue! I found this delightful book, "Rush Bearing: An Account of the Old Custom of Rush Strewing" from 1891 which discusses the issue in detail. Of particular interest is the quote on page 9: "than they lokyinge around hym, found some rushes of ye parlour stickynge in his slippars" -- which suggests individual rushes rather than entire mats. oinopaponton, have a look at the first page I linked... I'm not asking about ladies' hems getting dirty, but about how trailing garments would tend to pull along loose rushes and create trails of emptier areas and clogs of built-up rush piles. I think I can address that issue. I believe that herbs were strewn as well-- fleabane, lavender, chamomile, woodworm. I've always imagined that this was a housekeeping issue-- the chatelaine would see to herbs being strewn about in the smelliest, dampest, most infested places and freshly replaced as necessary. However this does not address the skirt issue. Somewhere, (sorry, Taz, I don't remember where) I remember reading about the hems of long gowns being replaced and reinforced by strips of decorative cloth. These could be embroidered, made of silk, covered in lace, as the lady's finances/tastes would allow. Page 58 (Ceilings and floors) of Liza Picard's Elizabeth's London has some relevant information but I am pressed for time. Quick summery: fresh rushes were a part of housekeeping, just as vacuuming is today. In 1561 rushes and herbs were still being used but were largely replaced by woven matting by the end of the century. The author notes that "new rushes have a lovely smell and they are quiet and comfortable to walk on." It would be nice if your source on the rush matting cited, you know, a single flaming reference. Because I think her article is packed full of innacuracies. I know medieval re-enactors who would have hysterical fits at her attempts to wear medieval dresses, and quickly tell her that, yes, that's what they would expect from someone who's put their corset on wrong! As for trenchers being glazed with egg white - why would you do that? I've never come across that in all my reading on medieval food, and it's a waste since they'll be perfectly good for the job without it. I'm not familiar with Erasmus, but I would suspect that any writer suggesting that buildings in England should be open on three sides to the weather is talking out of their arse. Also, being that he was Dutch this could well belong to the genre of "accuse foreigners of being drunk/dirty/generally uncivilized". I'm better on the earlier than later medieval period. Wear patterns on the earth floors of Viking houses at York suggest that they were frequently swept, so that any sort of loose floor covering like rushes would be frequently changed. I also fail to see how strewing herbs would work with rush matting - if you've ever trodden anything vegetable into a carpet you'll know what I'm talking about. So overall, strewn rushes, strewn herbs - then frequently changed by sweeping up the old ones would probably be a good solution, especially in high traffic areas where matting (which would take time and effort to weave) would wear out quickly. I'd not like to present this as a definitive answer, just to say that it's not impracticable. As for the fire risk - it was already present with all the tapestries and linens and the like (one of the most memorable stories from Joinville's 'Life of St Louis' is the Queen having to throw her burning bedclothes overboard from her ship, because of a carelessly placed candle). So rushes on the floor aren't really adding much. Again, the hems getting dirty isn't a part of my question, because I figure that they had borders that were removed and replaced, but your trailing gown is going to be dragging a pile of rushes with you if you are walking over loose, scattered straw-like stuff. Oh, well, couldn't women just shake out their hems periodically and then tell their servants to rake the hay back in place? oinopaponton: It might be helpful to consider the different standards of cleanliness that people, even aristocrats, held during the middle ages. I'm not a medievalist, but I've never heard anybody refute the clichés about universal stinkiness (no offense to the knights and ladies out there). To answer this, yes, after the black plague people stopped washing their bodies because it was thought that the plague entered people's bodies through the pores in their skin. On the other hand, they started laundering their clothes regularly. I would like to suggest that an important step was left out of their remarks about gathering fresh rushes for floor-covering. When original sources wrote that the rushes should be changed every season, certainly once a year in the spring after planting, they were not recording their behaviors for a foreign (in time) culture: they were advising their peers on good household management as opposed to slovenliness. The step omitted is that the rushes, once gathered, were made into mats. Then the rush mats, still called rushes, were put on the floor, and herbs sprinkled over them. River rushes are always specified; mere grass will not do. This is because the rushes are thick, long, and strong: short, fragile grass cannot be made into mats. The rushes were probably coiled by the handful and stitched with the longer rushes, like modern raffia or straw mats, or woven with string, or plaited. Obviously, rushes were day-to-day decor, not company best. All paintings of interiors on company occasions show cleared floors (no interior ever shows loose rushes). This is difficult to manage if you have to rake up and haul out bushels of vegetation and put it back the morning after, but not so onerous if all you have to do is stack the mats up in a side room. This is like us using protective slipcovers on the velvet or brocade front room furniture, which are removed when company is expected. Using rush mats extends the life of the flooring, cushions the surface underfoot, and cuts drafts. This view was recently semi-confirmed by an old Grolier's social studies text that showed a traditional Dutch kitchen interior, with rush mats over the stone or brick flooring. In one place at least, the habit survived into the twentieth century. Here's a modern example of loose rushes: I visited a sort of living history museum village in the Ukraine in 1981 and saw loose rushes on the floor of a peasant cottage. It was sort of a museum except that local people actually lived there but they were supposed to keep up the traditions of the village. So they wore local peasant costume while hanging out and chatting with visitors, etc. Anyway, the "living room" of this cottage had a hard earth floor with a thick layer of rushes spread over it. For an extra touch of OCD, the rushes didn't go all the way to the walls but stopped neatly a few inches away, like a large rug. (Must have taken constant sweeping to keep the edges tidy like that - crazy!) Visitors could go inside and chat with the old woman who lived there, through a translator of course. She said she changed the rushes several times a year, when they started to get dirty. On the plus side, walking on the rushes released a lovely fragrance of new-mown hay into the air. I doubt a woven rush mat would do that, since you're not crushing a pile of leaves with every step. So if you're a medieval lady and you can afford to have somebody else tidy your rushes and replace them periodically, it might be pleasant to have loose rushes on your floor. Worth hiking up your skirts for (and I doubt that everyday clothes trailed on the floor - only fancy party clothes). Secret Life of Gravy, re herbs strewn-- yes, herbs were strewn for the scent, but also for their insecticidal and antibiotic properties (think about the names-- fleabane, wormwood, shepherd's bane, all discourage insects, they are used this way in modern gardens as well). OP, perhaps, assuming the rushes were loose and not woven, it's that the rushes in question are long and heavy-- yes you might occasionally catch your trailing garments on them, but not that easily (see the pictures at the top of zeoslap's link for an idea of the size and weight of these). This is pure speculation on my part, just from reading the thread. I don't know anything about it except that I've read a lot of historical fiction and and nonfiction about the period, and the concept of "strewing rushes" is always referred to. [...] the usual floor,especially on the upper storeys, was wood, often covered with rushes and sweet-smelling herbs. Woven matting was replacing loose rushes by the end of the century. If you have visited an Elizabethan National Trust house early in the season, you will have noticed two pleasant aspects of the rush matting faithfully reproduced by the Trust. New rushes have a lovely smell, and they are quiet and comfortable to walk on. At a grand christening in the summer of 1561, the floor of the church was 'strewed with green rushes and...herbs,' which must have scented the whole church and perhaps reminded some people of the old days, when the smell would have come from incense. At a very grand occasion indeed, the 1562 procession of the Garter Knights at Windsor, the Queen's chapel was 'strewed with green rushes'. [...more about rushes being used] The floor of Lord North's great chamber was covered with 'twelve score  yards of matts' in 1575. It is surprising to find them still on the floor when it is to be used in dancing--'let wantons tickle the senseless rushes with their heels'-- but I suppose you got used to bits of rush in your dancing shoes. To save against March, to make flea to refrain. A little earlier, Erasmus had been very rude [my bold] about the horrors, including fleas, that lurked in unchanged rushes, but as far as one can tell fresh rushes were as much a part of good housekeeping for and Elizabethan woman as vacuuming the carpet is for us. So I think your answer is simply that rushes when strewn were soft and as they were trodden upon they became flatter and flatter to the point where nothing was sticking up to catch on one's hem, only perhaps bits of green might stick to your shoes. While I can't report on earlier styles, Elizabethan skirts did not, in fact, touch the floor but were worn high enough that one's shoes could be seen. This question could really do with some honing, because people who owned castles in the 16th century were not walking on straw of any description. As a rule of thumb, if the Victorians wrote something about the Middle Ages, roll your eyes and watch The Black Adder on DVD and take whatever they say as the absolute truth. I don't know that I buy the line that all 13th century women wore floor sweeping gowns all the time, or that they never held them up when they walked. Here is a woman carrying wood and holding up her skirt as she does so, from the Maciejowski Bible, 1250. More women without ground-sweeping gowns here. Note that if you page through the manuscript, there are women's gowns of all lengths; often noblewomen have much longer, dragging gowns as mentioned in your linked article. However I have a very hard time believing they never picked them up, particularly if they wanted to go upstairs on a narrow and steep Medieval staircase, or if they wanted to go near a fire in an open hall. Waddling around swinging your legs to the outside to lift your skirts as that kooky article describes is pretty near impossible in those situations. As far as rushes go: I've cut down rushes and used them as mulch in one garden I work in. They don't break down quickly at all, nor are they as light and easily swept around like straw. The stems are fairly smooth and round, and quite straight. I think it would be possible to walk around on them in a floor length skirt- certainly more possible than walking around in a dragging skirt without ever picking it up. They are actually kind of slippery- I nearly slid down the hill on them in one area- so it seems likely that gowns could slip across them without really picking them up. I was just reading the Agrarian History of England and Wales, and in the introduction to the fourth volume, Joan Thirsk notes that foreigners described 16th century English farm house as being pleasant - that they were cooled with water sprinkled on the floor, decorated with green boughs, fresh herbs and vine leaves - and also had sedges (aka a kind of rush) "spread out". No mention of any mats. people who owned castles in the 16th century were not walking on straw of any description. I'm curious about why you say that, fire&wings? "This custom of strewing the 'halle and bowres' was continued to a much later period. Hentzner, in his Itinerary, says of Queen Elizabeth's presence chamber at Greenwich: 'The floor, after the English fashion, was strewed with hay,' meaning rushes." "When Henry III, King of France, demanded of Monsieur Dandelot what especial things he had noted in England during the time of his negotiation there, 'he answered that he had seen but three things remarkable; which were, that the people did drinke in bootee, eate rawe fish, and strewed all their best roomes with hay; meaning blacke jacks, oysters, and rushes.'" The last suggests that it certainly wasn't happening in France by the 16th century, but was in England. From all I've seen here, and also with oneirodynia's helpful first-person observations of the physical properties of the rushes themselves, it definitely does seem that for the most part they were literally strewn, as opposed to rush mats being strewn. 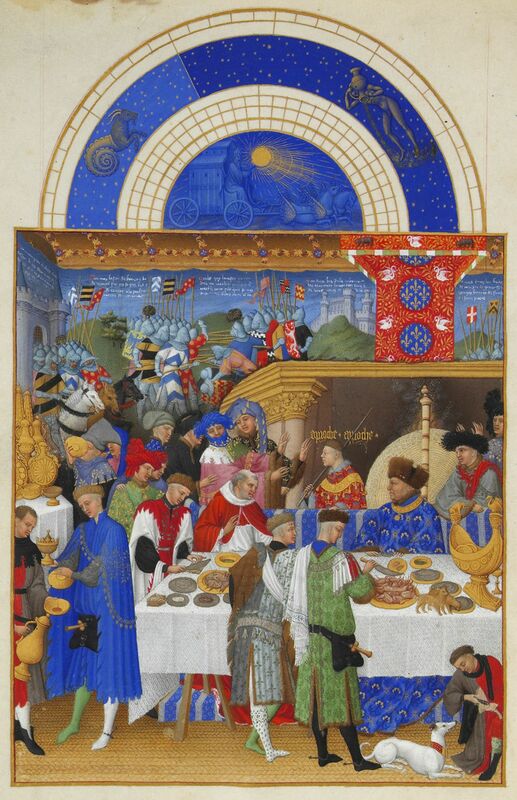 There aren't so many contemporary paintings of medieval indoor life that aren't (in the case of religious art) either likely sanitized for aesthetics' sake or else to show the skill of the artist in depicting a complex tiled floor, but here's one from the Très Riches Heures du Duc de Berry (~1410) that does support the woven-mat theory, at least in the great hall of one of the more aesthetically-concerned noblemen of the time period. Lengths of garments for men and women were about as extreme during this time period as they ever became, so it would make sense that those who could afford it did use mats. Important part as usual being, there, "those who could afford it".